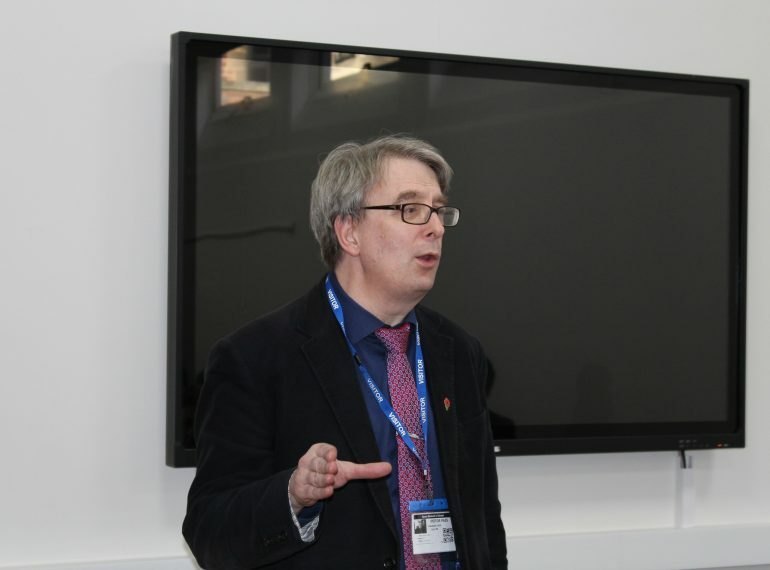 A Brexit specialist from UCL’s European Institute gave boys some expert insights into the current political turmoil in a lecture to Years 10 and 11. Clément Leroy, a Research and Policy Engagement Associate at the institute, came to QE to explain the background of the recent ‘meaningful vote’ in Parliament and looked at all the major issues involved. Although he did not, of course, know how things will play out in the coming weeks, he suggested that a ‘no deal’ outcome is quite possible – and even likely – given that this is the default position if a deal is not agreed and approved by Parliament. Mr Leroy worked on Brexit at the French Embassy in London and on EU economic policies at the French Ministry for Foreign Affairs in Paris prior to his appointment to the European Institute. Nisha Mayer, Head of Academic Enrichment, thanked Mr Leroy for his visit: “He did a good job of explaining the current situation, bringing some clarity – if not solutions!. Among the topics Mr Leroy covered during the lecture were the initial referendum, the negotiations, the Irish backstop and the potential outcomes and how we might reach them. Boys also had the opportunity to ask questions. Visiting expert Gabriella Rutherford not only helped boys understand the threats and challenges faced by tribal people around the world, but also encouraged them to reflect on lives that are different from – and sometimes surprisingly similar to – their own. 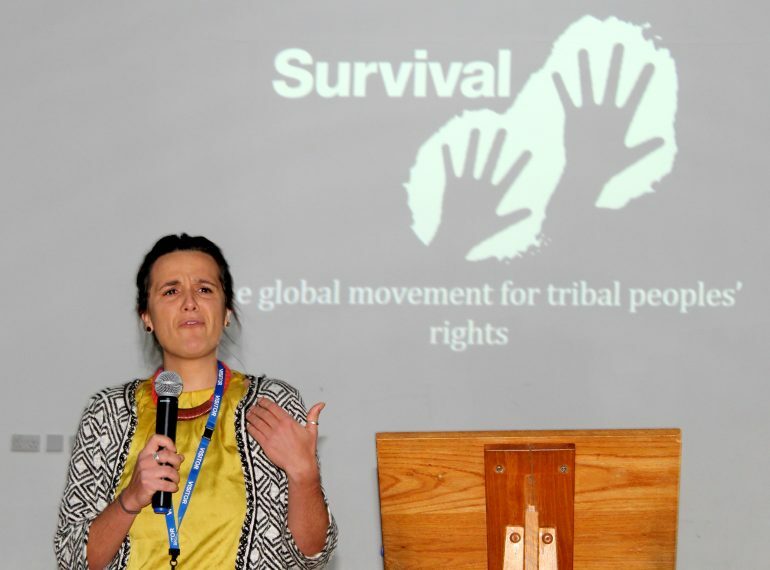 Gabriella, from Survival International, the global organisation championing tribal peoples’ rights, spoke at a Lower School lecture assembly. She focused on the challenges facing tribal people around the world and encouraged the boys to think about ‘otherness’. She looked at how our conceptions of other people and groups are often based on the ways in which we believe they are different to us. She asked the boys to picture a tribal person in their mind. Establishing the sort of image that is often conjured up – a jungle environment, spears, feathers and bare chests – she looked into where that image comes from. She then pointed out that while such tribes do exist, there are others that look and live more like us than we might imagine, particularly among contacted tribes with whom there has been cultural and economic exchange. Gabriella touched on the ongoing threats to tribal people from racism and prejudice, and from those who advocate taking control of their lands in the public or national interest – as, she said, President Bolsonaro is hinting at in Brazil. Head of Academic Enrichment Nisha Mayer said: “This was an engaging assembly, which required the boys to consider and voice their own ideas. Whether there is ever justification for the outside world making contact with an uncontacted tribe. On the final point, Survival International’s view is that there really is no such justification, since: it is impossible for us, as outsiders, to assess the harm that we might be doing; since tribal peoples have human rights, just as we do, and these should not be forfeited to some notion of the ‘public good’; and since they are equipped to deal with problems in their own ways, even if these ways are different from ours. Gabriella encouraged boys to consider getting involved in the Survival International Youth Action Group that is being established. It was standing room only in the Conference Centre when Mark D’Arcy, the BBC’s Parliamentary Correspondent, gave a talk to the Politics Society. 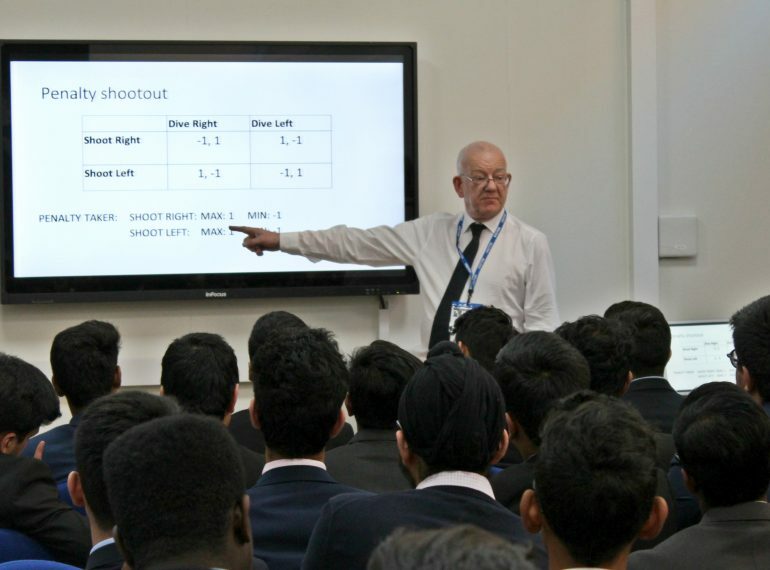 With boys eager to hear an inside view on the political machinations surrounding Brexit, Mr D’Arcy’s lecture proved a significant lunchtime draw. Mr D’Arcy who has been a correspondent for Today in Parliament since 2002 and presents BBC Parliament’s political review show, Book Talk, covered the biggest issues of the day in Parliament. He talked about Brexit in depth, touched on how Parliament operates and shared his own experiences as a journalist. His career has included stints at LWT’s Weekend World and the Leicester Mercury. Since joining the BBC he has also produced, and occasionally presented, Radio 4’s The Westminster Hour. Mr D’Arcy said that Brexit is the biggest thing he will have seen go through Parliament, whether the deal is passed or not. He predicted the process will be very difficult because of the Parliamentary arithmetic and the differences of opinion, particularly within the Conservative Party. But he added that Labour is also divided – their strategy seems to wait and try to force a General Election. But would the public want another one? he wondered, adding that General Elections are exhausting for journalists. At this stage, no serious commentator can really predict, with any certainty, how it will all end up,” he added. Mr D’Arcy went on to talk more broadly about Parliament, paraphrasing a quotation attributed to Churchill that Parliamentary democracy is “the worst system, apart from all the others”. He talked through the make-up of Parliament and mentioned safe seats and how they give those members a different focus to those in a close marginal. And yet history shows that those in supposedly safe seats may still have a shock at election time, he pointed out. Other topics covered included the structure and functions of Parliament, including more technical matters, such as statutory instruments and different mechanisms for changing the law. He noted the difficulties associated with the government not having a functional majority – as seen with the recent row and Government climb-down over fixed-odds betting terminals. He was also asked who would be most likely to win a Tory leadership election, to which he said it would depend upon the circumstances under which it arose. Any run-off was likely to be between a ‘remain’ candidate (that is to say, someone who would have been in favour of a remain vote in the original referendum, though might now support the UK leaving the EU) and a ‘leave’ candidate, an enthusiastic Brexiteer. Mr D’Arcy describes himself as a politics nerd, a cricket fanatic, an amateur cook and a Bruce Springsteen fan. Only a few short months after starting his job as a Civil Service economist, Old Elizabethan Andrei Sandu was already advising a Government Minister at a European summit, he told senior boys at a special lunchtime lecture. 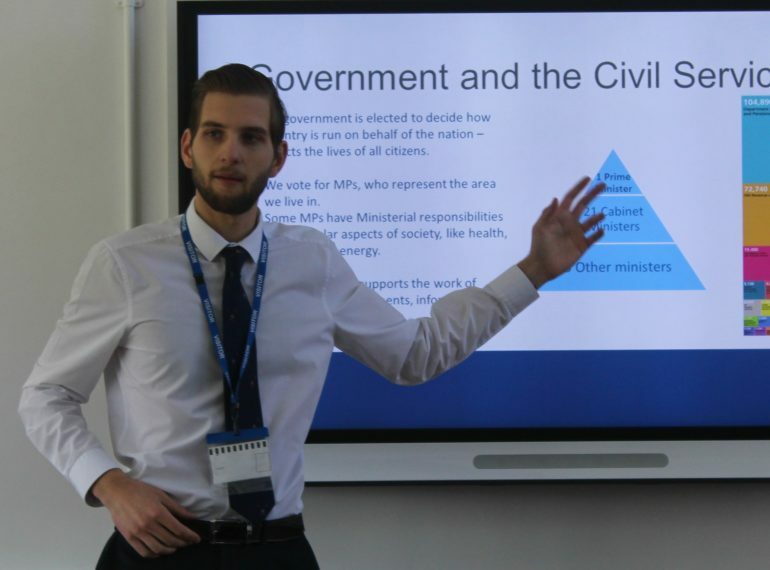 Andrei (OE 2007-14) took up his role in August last year with the Department for Business, Energy and Industrial Strategy (BEIS) as part of the economists’ group of the Civil Service Fast Stream. By the autumn of 2017, he was called upon to attend a Council of Ministers summit in Brussels, where he advised Lord Henley, of BEIS, throughout the session. “There are few jobs where just four months in you are able to shape UK policy and EU law,” he told the boys as he promoted Civil Service careers. After his lecture, he also conducted a number of mock interviews with pupils considering studying Economics at university. After leaving QE, Andrei read Economics at Durham, where he gained a first-class degree last year. In broad terms, he set out for the lunchtime audience both the departmental structure of the Civil Service and his own role, which involves advising the Government of the day and supporting it in implementing its plans, while remaining politically neutral. He also provided information about BEIS, including the history of the 2016 merger of the Department of Business, Innovation & Skills with the Department of Energy & Climate Change to form the new department. His role at BEIS is as lead economist working on EU energy regulations, analysing draft laws and regulations to explore which aspects the UK would consent to and which it would want to see amended. He considers factors such as how much implementation would cost, the likely policies required to achieve particular targets and how measures should be phased in – whether, for example, to stipulate even progress each year or whether instead to specify an incremental build-up. Andrei will return to QE on 22nd November for the School’s annual Careers Convention, where he will give his support and advice to boys in Year 11 beginning to think about their future career paths. 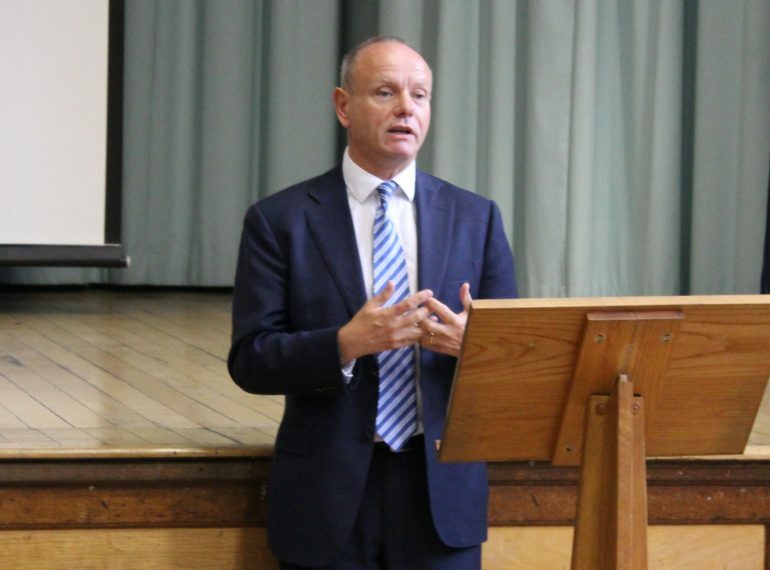 Media reports about the extent of divisions within the parliamentary Conservative Party over the Brexit negotiations are well wide of the mark, MP Mike Freer told sixth-formers. The Tory MP and former QE governor came into School to speak to Year 13 in a special assembly and responded robustly when asked whether he thought splits in the party would prevent the Government from winning any vote on Brexit. “I sometimes feel as if I work at a different House of Commons to what I see portrayed in the media,” said Mr Freer, an Assistant Government Whip and MP for Finchley and Golders Green. He stated that the vast bulk of the Parliamentary Conservative Party supports the Prime Minister, adding that not only had she been a successful Home Secretary, but that she also knew Europe and understood that good deals inevitably happen at the very last minute. And Mr Freer had another example of how perceptions of British politics can be affected by the media: he pointed out that although the chamber of the House of Commons usually appears quite empty on the BBC Parliament channel, this was because most of Parliament’s work was in fact conducted outside the chamber. Mr Freer was on QE’s Governing Body when he was as a councillor in the London Borough of Barnet, where he served as Leader prior to running for Parliament. He spoke to the boys about the true role of MPs in the legislative process and about how to effect changes in public policy, before answering their questions on a wide range of political topics. An MP’s job is to scrutinise the law, not make it, he explained. The law usually comes from the Government, which is the executive. However, there are a number of ways in which MPs can achieve a change in the law, through lobbying, questioning, building consensus, and trying to amend legislation as it progresses through Parliament. One approach is to hang an amendment on to a piece of legislation already tabled – known in the US as a Christmas tree bill. Westminster Hall debates – for which MPs sit in a horseshoe arrangement intended to encourage non-confrontational discussions – provide another opportunity to influence, he said. Remove ‘poppers’ from the list of drugs controlled under the Psychoactive Substances Act 2016 (having challenged the Department of Health’s evidence about their health impact). Extend the Human Papilloma Virus (HPV) vaccine’s availability to include boys. “Changing public policy is the most worthwhile thing about being an MP. I’m proud if I’ve stopped one person getting an HPV-related cancer,” he said. “Easy! I’m a democrat,” he replied, adding that the Brexit referendum was the largest democratic vote in the country’s history and that all should therefore respect its outcome. There were also questions on his voting record, including one on tuition fees. One sixth-former put a particularly thoughtful question about community relations: how did Mr Freer reconcile religious rights with the rights of other groups, such as the LGBT+ community, within such a diverse constituency. His answer was that trust is built over time as people get to know you as their MP and see you working hard for the local area; this allows you to disagree on particular issues without destroying those relationships. 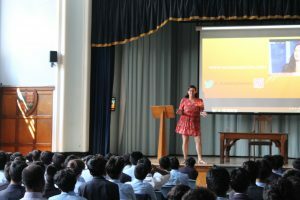 An award-winning mental health campaigner gave senior boys some serious food for thought when she visited the School. 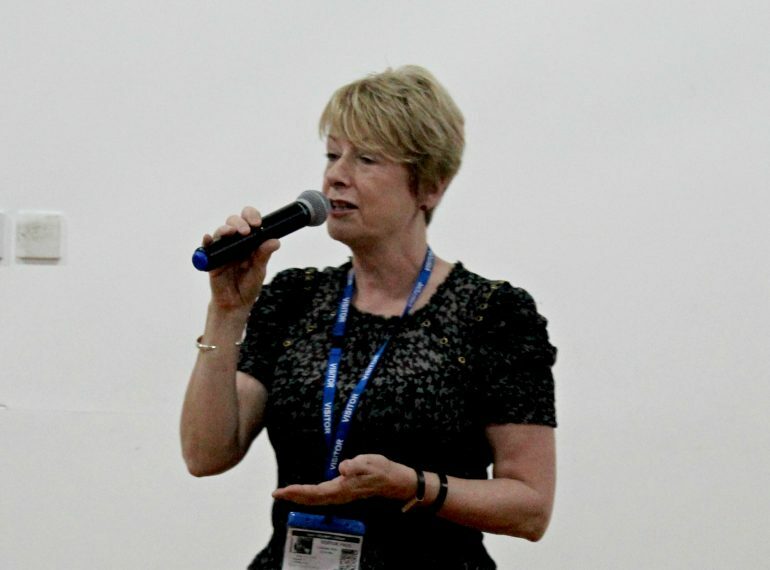 Natasha Devon looked at topics ranging from the need to deal with stress and the perils of stoicism, to the limitations of the English language, during a lecture assembly given to Years 10 and 12. She made sure her answers were truly relevant by inviting boys to submit their questions anonymously in advance – and received questions on body image, the pressures on men to not cause offence, social media, examination stress, gender and even the TV programme, Love Island. 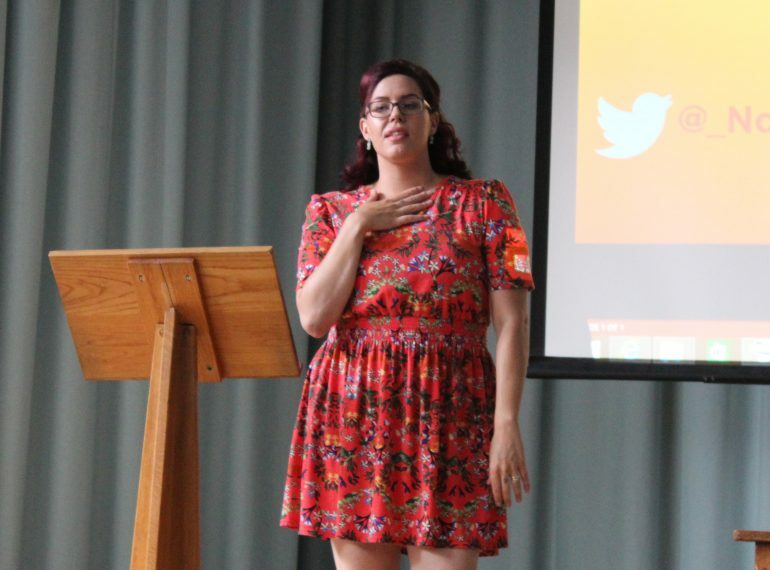 Natasha, who won an MBE for services to young people in 2015 and a Fellowship from the University of Wales in the following year, used the boys’ pre-submitted questions to structure her talk. She emphasised that stoicism should not be equated with strength, telling the boys that they could, in fact, demonstrate strength by talking about problems, confiding in others and seeking help. Yet she acknowledged that this could be tougher for boys than for girls because gendered language equates masculinity with strength. She suggested gender is a spectrum and that generalisations such as ‘men are like this’ and ‘women are like that’ only deal with an average and, even then, one that most people would not fully identify with. She recounted her experience of trying to deal with difficult family matters when she was about ten years old – and the eldest child among her siblings and cousins – by being ‘strong’, reasoning that because things were not happening to her directly they were not really affecting her. But this, she felt, probably contributed to the anxiety, panic attacks and eating disorder she suffered from subsequently. Natasha, who has authored and contributed to books on mental health, urged that, just as physical health is considered relevant to everyone – not just those who are ill – so everyone should be aware of mental health: it should not be considered to be an issue only for those who experience a mental health problem. While encouraging the boys to discuss things with each other, she pointed out that they could not expect to be able to fix other people’s mental health issues, just as people who are not doctors would not expect to be able to cure a physical ailment. There were measures that laypeople could take to help, however: she is promoting having trained mental-health first-aiders in all workplaces. (QE’s pastoral staff have already been trained.) Importantly, she said, such training helps people know what to say and what not to say: although English had the greatest variety in its vocabulary overall, it was far more limited than many other languages in expressing feelings and emotions – something, she opined, which doesn’t help! • Feel that your voice is heard. She advised the boys that they needed to deal with stress so that it does not “overflow”. Mindfulness techniques, endorphin-releasing physical activity and taking breaks from revision could all help and might even prevent one’s mind going blank in an examination. 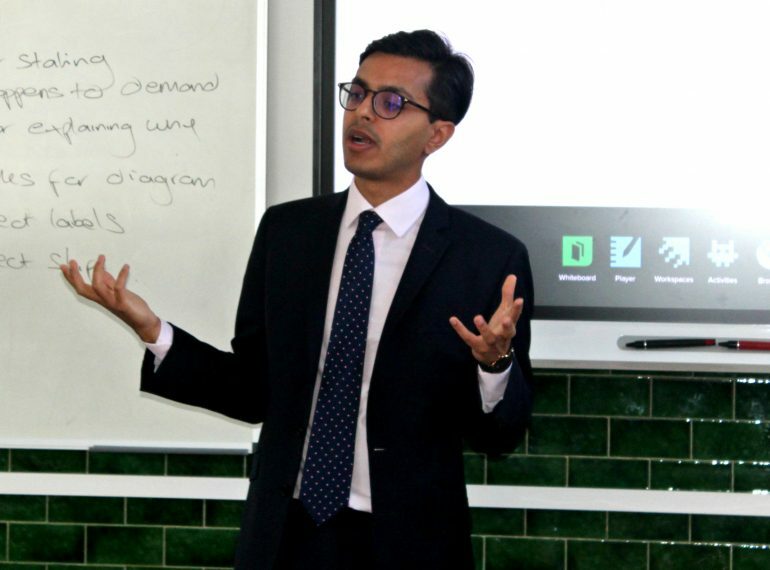 Economics Society guest speaker Lal Chadeesingh gave pupils an insider’s view of how behavioural economics is being applied to UK public policy – and explained that it all stemmed from the personal interest of David Cameron. Lal works at the Behavioural Insights Team – a group that was the brainchild of former Prime Minister Cameron, who set it up under the Cabinet after reading the seminal book, Nudge. The team was later spun out into a company part-owned by the Government which now works to improve the effectiveness and efficiency of Government measures. Lal, who read Economics at Durham before completing a Master’s degree in Economics and Public Policy at Bristol, introduced boys to the principles behind behavioural economics as described in Thinking Fast and Slow – another key work about this emerging discipline and one of the first books to introduce it to a wider public. 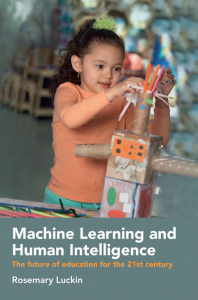 The book contrasts two modes of thought: fast, which is automatic, intuitive and requires little to no effort, and slow, which is conscious, more deliberative and logical. While traditional assumptions among economists and policy-makers about the existence of homo-economicus (a purely rational decision-maker) take no account of this dichotomy, exponents of behavioural economics have used it to develop a theory of predictable irrationality. The Behavioural Insights Team uses this understanding to tailor policies and their implementation so that they are more effective in generating the desired results, explained Lal, who began his career working in the Civil Service under the then-Business Secretary Vince Cable. It has condensed its guidance into a simple mnemonic, EAST (Easy, Attractive, Social, Timely), for policy-makers to keep in mind. We are expecting you at Mile End Hospital on Sep 16 at 10:00am. Not attending costs NHS £160 approx. Call 02077673200 if you need to cancel or rearrange. This change reduced missed appointments by 2.6% which, although a diminutive percentage, equates to 400,000 appointments nationwide. 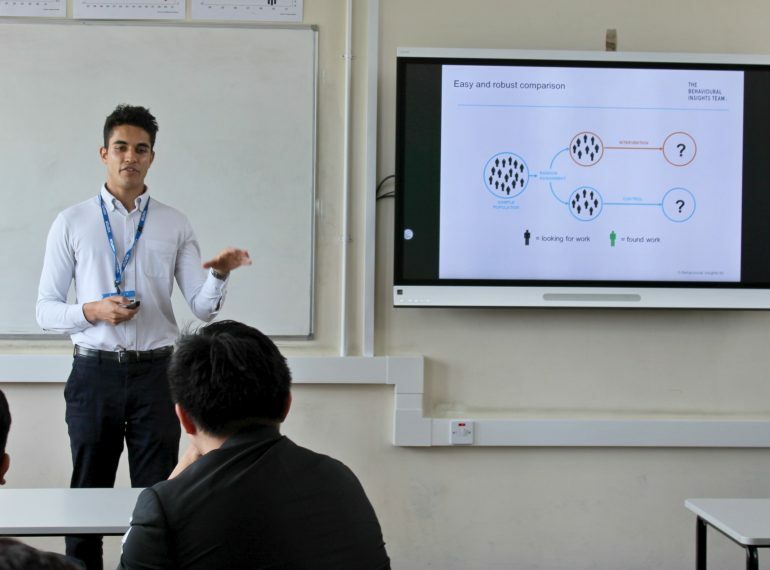 Year 12 economist Mipham Samten said that, to some amusement from the boys, Lal also explained the theory behind painting a small fly on the back of lavatories – a small, subtle image getting men to focus on the task at hand and reducing the chances of spillages by a significant rate.